I'm late for my WIPocalypse update, and even later for Theme-a-licious. I seem to be on a downward trend. For WIPocalypse, I'm not doing so great. The only previously existing WIP I worked on for the last month was a bit of my BBD Anniversaries of the Heart. I did much better with Theme-a-licious for February, so much better it seems to be extending into March as well. We were supposed to stitch on our projects by our favorite designer, and I chose Black Bird Designs. I was hoping to tie it into AOTH. 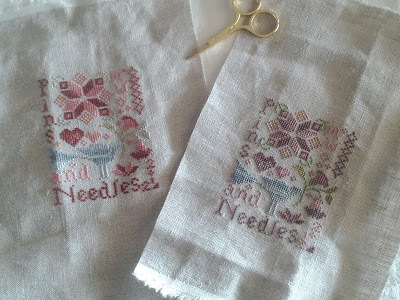 Instead, I seemed to catch the smalls bug after doing the January and February CCN cottages. Both the exact same design, just the one on the left being close to the called for threads, and the right one being a new color palette I chose. Hopefully in the next day or two I can get both of these finished into pincushions. Right after I took this pic I ended up finding some backing fabric for them in my mom's quilt fabric scrap drawer. A quilter's scrap drawer is a cross stitcher's heaven for finishing smalls. 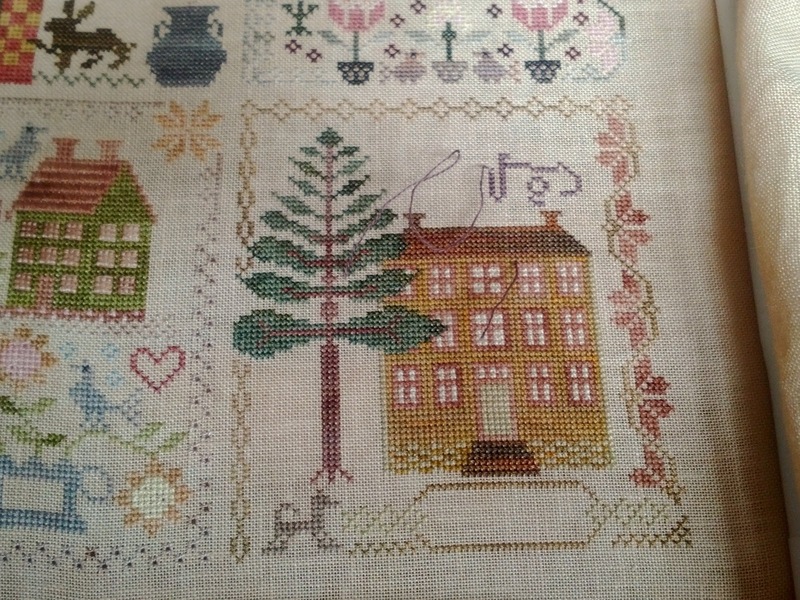 Right now I'm working on another smallish BBD chart, but have so little stitched its not even worth a picture, and its meant to be a gift. I can thank the lack of progress on it to a tiny mistake on the first night's stitching which meant I spent the second night frogging. Usually I'll just adapt and work around my mistakes, but this is one that was going to annoy me and make the rest of the chart just slightly off. Out it came. I caught a very un-ladylike picture of Annie the other night. 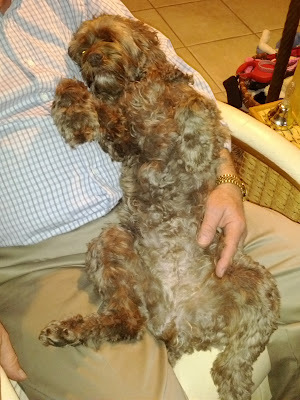 This is just one more of her "rub my belly" poses. She was also sound asleep like this, until the flash went off on my camera phone. Grandma is hanging in there. She was moved to a rehab facility last weekend, and has her good days and bad days. One thing I've learned is you need to really keep on top of those facilities and make your presence known. I think every employee there know's I'm 31C's granddaughter, and to watch out for me. I know for a fact the Physical Therapy department is going to be giving her good care, and there's a chance I got one employee fired. Don't you dare log you gave my grandmother PT when you didn't, and don't be so stupid as to log the time right when I was visiting and can prove you didn't do your job. Better the PT department fire one person than get turned into Medicare for fraud. Enough about that, Mom and I have decided we have them whipped into shape enough that we can back off the twice a day visits to just once a day. Dad and I went for a visit yesterday and enjoyed some nice time with her outside, for an al fresco lunch. It was such a nice time I decided to ignore her not touching any of her food, except for the ice cream. Right now I'm just trying to do anything to keep her happy and comfortable. We're all a bit concerned since her blood pressure and pulse have really been dropping very low, and there's a strong suspicion her kidneys are failing. At 91, almost 92, we're not going to pursue the dialysis option. Hospice will be the priority, when the time comes. I'm trying to get caught back up with school, but me writing this blog post is really just me procrastinating. I finally got back to a spin class on Thursday after missing a whole week, and OMG, it was painful! I went to a Saturday class to try and make up for so much missed the week prior. It must have paid off since my weekly weigh-in this morning showed a loss (finally!) instead of just holding steady. Thank you to everyone for all your kind thoughts and well-wishes, its really meant a lot to my family and I. I'm not always perfect about responding to all the comments left, but I'm really trying to get better about it. Your AOH is stunning with the silks!!! I admire that you switch up the color palette on designs to make them your own. Best wishes and good thoughts go out to you and your Grandmother. Oh, beautiful stitchinjg Mindi! WOW! Better late than never, especially with beautiful stitching! Your BBD stitching is just stunning! Best wishes for your grandmother. What beautiful work on AOH! Congratulations on keeping the nursing home honest, as well as on your weight loss. You're doing everything right, it seems! You and your grandmother and the rest of your family have been in my thoughts. The stitching is very beautiful. Congratulations on a loss! You are headed in the right direction! Good for you, holding the PT dept accountable! WONDERFUL stitching. I absolutely adore your Anniversaries of the Heart! Continued thoughts and prayers for your grandma. Your stitching is beautiful. Love seeing how different a piece can look with different colors! Congrats on your loss! It is never an easy battle, is it? Your AOH is looking beautiful. Your two finishes are both lovely. Great pic of Annie, she is so sweet! Your AotH is gorgeous!! Love the BBD Pins and Needles pieces too! Love the pic of Annie. Hope your grandmother is doing ok.
Love your stitching!! And i'm glad your grandma is feeling better. Your AOTH is looking beautiful. I love the block you're working on now. Can't wait to get to that one! And I love your two versions of the pincushions you finished. So cute! Your AoTH is really pretty. Good for you for keeping the PT department in line, and if someone lost their job, then they deserved it. And congrats on your weight loss - I know that it's not easy! 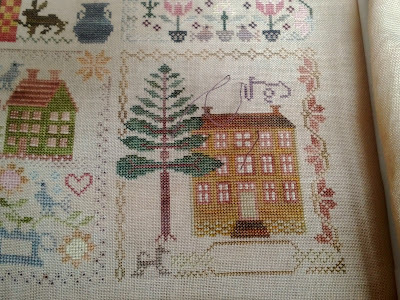 I stitched the pincushion of BBD too. I really prefer your color palette on the BBD piece, Mindi--great choices! 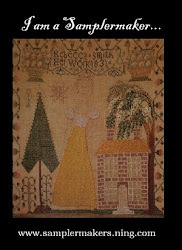 I don't know how you're finding any time at all to stitch with school and visiting your grandma at the rehab facility. Good for you for keeping an eye on lazy employees--I would be so upset, too, and I'll bet it happens far more often than we realize! AotH is looking great. Love the two Pins and Needles version you stitch. Different yet both equally beautiful. Best wishes to you and your grandmother. Lots of good thoughts for you and your grandmother. Beautiful stitching Mindi! I'm a big fan of BBD so I'm really enjoying your AotH. Lovely work on the smalls too! WIPocalypse doesn't have to be all about WIP. It can include current stitches too! I'll continue to keep your grandmother in my prayers.